Kevin Spacey’s House of Cards Video Not Even the Worst Kevin Spacey News TodayThe actor was also charged with sexual assault in Massachusetts on Monday. How House of Cards Pulled Off Claire Underwood’s Final Big TwistWhat to expect when you’re expecting an HOC surprise. The Legacy and the Lunacy of House of CardsThe show’s final season considers serious issues raised by the 2016 election, and it also gets completely nuts. The House of Cards Team Wrote Their Final Season. Then They Wrote It Again.How the writers’ room regrouped (and killed off Frank Underwood) in the wake of the Kevin Spacey allegations. How Frank Underwood Dies in House of CardsIf you don’t watch the show anymore but still wanna know, we’ve got you covered. House of Cards Series Finale Recap: I Just Died in Your Arms TonightNothing in this farewell season needed to be about Frank Underwood. House of Cards Recap: Going in for the KillLiterally everyone left on this show is capable of murder. House of Cards Recap: Birth and a NationThis season has somehow become obsessed with pregnancy. House of Cards Recap: Time’s UpCan we talk about Duncan’s hair for a second? It has Chalamet aspirations it can never reach. 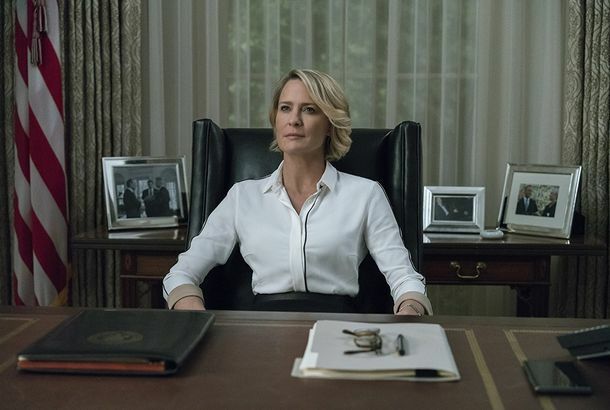 House of Cards Recap: The One That Got AwayOld faces come back to haunt Claire and Doug, reminding these unlikely partners that their pasts can’t stay buried forever. House of Cards Recap: Hey Ladies!In House of Cards, as in life, everything improves when bumbling, boring men get out of the way. House of Cards Recap: I Want to Hold Your HandIs this entire season going to be about the man House of Cards fired? House of Cards Season-Premiere Recap: Shot CallerOne hundred days into Claire Underwood’s presidency and the people’s reviews are … mixed. There Is Life After Death for House of Cards and The ConnersBoth shows are fascinating, though each ends up being mainly about the void left by the loss of its star. No One From House of Cards Wanted to Go on Megyn Kelly’s ShowWomp, womp. Stephen Colbert Missed His Chance at a House of Cards Role of a LifetimeRobin Wright confronts him about it. House of Cards Season 6 Trailer: Meet Your Commander-in-GriefIt’s Madame President to you. House of Cards Teaser: ‘The Reign of the Middle-Aged White Man Is Over’Claire Underwood’s gone gangster. 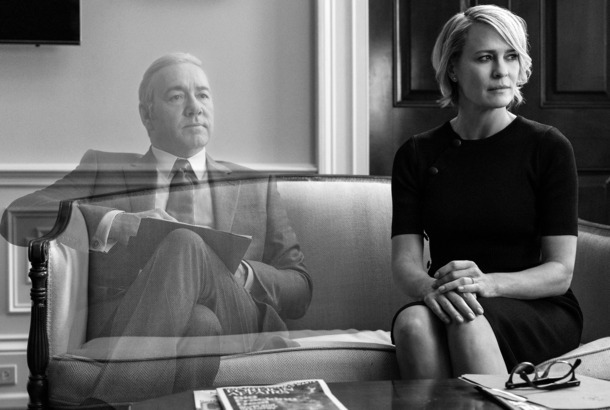 House of Cards Teaser: Claire Visits Frank Underwood’s GraveLong live Robin Wright. House of Cards: What Shady Things Are Diane Lane and Greg Kinnear Up to?And what is Claire Underwood doing with Frank’s ring? House of Cards’ Final Season Will Arrive Just in Time for the Midterm ElectionsMark your calendars for November 2. Netflix Would Make Another Season of Master of None ‘Whenever Aziz Is Ready’The streaming giant offered its first public support of Ansari after he was accused of sexual misconduct. We Have Robin Wright to Thank for Saving House of Cards, Post-Kevin SpaceyHer co-star, Patricia Clarkson, spills all. 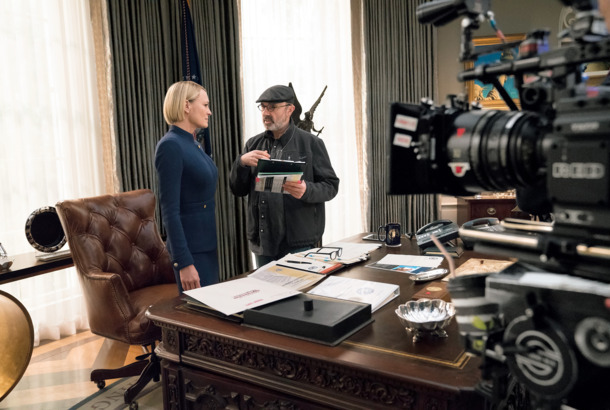 See Robin Wright Take Charge on the Set of House of Cards’ Final SeasonShe’ll lead both the White House and the show when it returns this fall. House of Cards Final-Season Teaser: Her TurnDon’t let the White House door hit you on the way out, Frank. ACS: Versace’s Cody Fern Is Getting a Role on House of Cards Fern was reportedly going to play a love interest to Spacey, but is now having his role retooled. House of Cards Resumes Production, Adds Diane Lane and Greg KinnearProduction is back in action following Kevin Spacey’s firing. Why Did Netflix Decide to Move Forward With a Final Season of House of Cards?Producers plan on scrapping most, if not all, of the footage they’d already shot in October, sources tell Vulture. House of Cards Will Return for a Final 8-Episode Season Without Kevin SpaceyProduction resumes next year. House of Cards’ Hiatus Has Just Become a Lot LongerNetflix hasn’t solidified its post–Kevin Spacey plan yet. House of Cards Crew Say Beau Willimon Knew of Kevin Spacey’s On-Set HarassmentHouse of Cards showrunner Beau Willimon previously said he didn’t know about Kevin Spacey’s history of harassment on set. House of Cards Creator Claims He Wasn’t Notified of Kevin Spacey AllegationsEight people claim Kevin Spacey sexually harassed and assaulted people on the set of House of Cards. Kevin Spacey Is ‘Taking the Time Necessary to Seek Evaluation and Treatment’Spacey has been accused by multiple actors and a filmmaker of sexual misconduct. Netflix Suspends House of Cards Production in Wake of Kevin Spacey AllegationsNetflix already announced that the series would end after the next season. House of Cards Will End After Sixth SeasonThe news comes after allegations of sexual misconduct against star Kevin Spacey. Russian Trolls Reportedly Watched House of Cards to Learn About AmericaIt was supposed to teach them about American politics and culture. Here’s How the 2016 Election Played Out on House of CardsSpoiler: It doesn’t end in 2016! House of Cards Season-Finale Recap: My TurnWhat did Frank know and when did he know it?